Interested in keeping up-to-date with the latest NATF news and insights? Subscribe to our bi-monthly newsletter, The Beat. 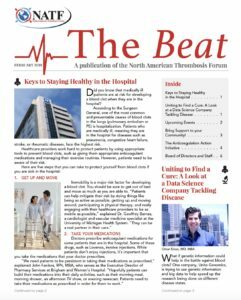 Dedicated to providing patients and healthcare providers with the information they need to combat thrombosis, The Beat features a wide range of articles, including updates on ground breaking research being done in the field of thrombosis, patient profiles, heart healthy tips from medical experts, healthy recipes specifically chosen for patients with thrombosis, and updates on the ever-growing programs that NATF puts on throughout the year. Readers get a first-hand look at NATF’s upcoming events and initiatives. In addition, The Beat also features an “Ask the Expert” section where thrombosis specialists address questions from patients, covering topics that range aneurysms of the aorta to blood clot formation.